MRI traditionally helps doctors determine whether someone is a prostate surgery candidate because it can show whether the capsule is involved. Now it can help monitor the medical management of men with intracapsular disease. One in six men, mostly over the age of 65, will be affected by prostate cancer in his lifetime, according to the National Cancer Institute. While most will die of something other than their prostate cancer, early detection leads to increased survival just as it does with many cancers. Indeed, the five-year survival rate for patients with prostate cancer who are diagnosed and treated early approaches 100%. Current methods for the early detection of prostate cancer include the digital rectal exam and a blood test for prostate-specific antigen (PSA). If the results of either one are suspicious, a core needle biopsy is medically indicated. During the procedure, tissue samples are taken from different areas of the prostate and examined under a microscope. The problem is that, in nearly all cases, the biopsy is essentially done blindly. The urologist tries to sample each of the six sectors of the prostate—the right and left sides of the base, midgland, and apex—at least twice. “The hope is that because prostate cancer tends to be multifocal or infiltrative, we will randomly find the cancer,” says Daniel J. Margolis, MD, an assistant professor of radiology at the UCLA David Geffen School of Medicine. About 1 million prostate biopsies are done annually. Studies show that these biopsies miss about 20% of all malignancies and generally underestimate the disease. Margolis finds that results vary. “Sometimes, we find a very small amount of cancer. Sometimes, we find a very large amount of cancer. Sometimes, we find none at all,” he says. However, accurate results are critical, as they determine how the patient is treated. “The physicians will decide whether it is best that the patient be watched or go to surgery, radiation therapy, or hormonal therapy—basically, what happens next,” Margolis says. Over the last decade, researchers began looking at MRI as a way of improving the early diagnosis of prostate cancer, just as MRI has increased early breast cancer detection in women who are at very high risk and or who have very dense breasts. However, Filerman says, there are important differences between MRI of the prostate, a highly vascular organ, and MRI of the breast, a glandular or fatty organ that is more accessible. “One is that many more image samples are taken in time with prostate imaging. Another is that the temporal spacing between image samples is much shorter with the prostate,” he says. The reason for the difference in sampling and spacing is that the prostate is filled with numerous blood vessels, and the entire organ will show enhancement in the gray-scale MRI images when the contrast is injected, Filerman says. Here’s where MRI computer-aided detection (CAD) comes in. CAD is crucial for reading and interpreting prostate MRI studies. Without CAD, it is extremely difficult to determine which areas of the prostate demonstrate rapid wash in and wash out of the contrast agent. “With CAD, these regions of interest are more easily identifiable due to the colorization of the images,” Filerman says. “With prostate MRI, lesion morphology is difficult to assess, so contrast kinetics becomes an important tool to differentiate benign and malignant lesions. That’s why CAD is effectively indispensible when assessing prostate with MR imaging.” iCAD offers the only FDA-approved CAD analysis system for prostate cancer: VividLook for the analysis and CADVue for the review and reporting. Marc Liebeskind, MD, JD, of Park Avenue Radiologists in New York City, says he was trained to read breast MRI without CAD. “But you cannot do dynamic contrast-enhanced prostate MRI without CAD,” he says. Liebeskind uses iCAD’s system, which uses an algorithm based on all-available-time-points technology and signal changes defined by tumor physiology. Margolis uses CADstream for the prostate, which is still an investigational device in the United States. It has been approved in Canada and the European Union. CADstream allows him to more quickly locate areas of suspicion and “make certain that I don’t miss cancers,” he says. Currently, the protocol is to perform prostate MRI if the PSA test, digital rectal exam, and biopsy are suspicious. But it could be used to eliminate unnecessary biopsies and help better guide the biopsies that are necessary, Filerman says. Like breast MRI for high-risk women, it may someday become part of a screening imaging protocol for men over a certain age. In March 2007, the American Cancer Society revised its recommendations for breast cancer screening, saying that women who are at very high risk should undergo mammography and MRI annually, either at the same time or at six-month intervals. Most insurers are reluctant to pay for prostate MRI without biopsy-proven cancer diagnosis. Some will pay for MRI with an abnormal PSA but, currently, most will not, Margolis says. However, he says it seems easier to get approval for contrast MRI than spectroscopy, which looks for the presence and concentrations of chemicals in the prostate that could indicate cancer. Also, the images needed for spectroscopy take longer to acquire, he says. A prostate MRI with spectroscopy takes about 45 minutes to 1 hour. MRI for prostate is still in the formative stages, Filerman adds. “Only a limited number of places in the world are actually doing it, and only about 30,000 prostate MRI studies are being performed annually, which is minimal when compared to the about 800,000 breast MRI exams being done each year. But we think the potential is large because the clinical benefit could be huge,” he says. Most prostate MRIs are done on 1.5T magnets. “That’s by far the most common field strength,” Margolis says. Some radiologists believe that an endorectal coil is needed to get adequate resolution with 1.5T magnets. The coil, covered with a balloon, is placed inside the tail end of the large bowel. “Placing the coil takes time, and it’s uncomfortable,” Margolis says. More radiologists are finding that with 3T magnets, the endorectal coil may be unnecessary. Not needing a coil could be a big advantage, not only because it is cumbersome and uncomfortable but also because the coil can press on the prostate and change its shape, a factor radiation oncologists consider when prescribing the radiation field. Margolis believes that if the coil can be eliminated, more prostate MRIs will be performed. “I think with the increasing prevalence of 3T magnets, once we’ve perfected the technology of doing it without an endorectal coil, it will become more common,” he says. As the exam becomes more common, radiologists will become more familiar with reading them, and that ability will likely increase usage as well, he says. Prostate cancer is typically a slow-growing cancer, and many men who develop it will die of something else. Because of the prostate’s location, treatment can have many side effects. And if it is possible to avoid unnecessary radiation and/or surgery, that could be to the patient’s advantage as long as his condition is able to be closely monitored, Liebeskind says. Prostate MRI also can be helpful for diagnosing a recurrence, he says. “If a patient has had a prostatectomy and his PSA continues to rise, MRI may prove to be a valuable diagnostic tool to see if the cancer has recurred,” he says. Liebeskind and Margolis also believe MRI would be preferable to repeated biopsies because they are generally unpleasant and can cause inflammation and scarring that can lead to misdiagnoses and make future surgery more challenging. The whole field of treatment for prostate cancer is undergoing a rapid change, Margolis says. “There are new ways to treat it surgically and medically, including minimally invasive or noninvasive therapies such as image-guided intensity-modulated radiation therapy. 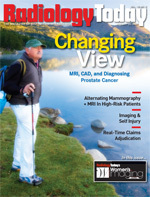 I believe that the standard of care for prostate imaging may someday involve prostate MRI. CAD will become standard soon, but how it fits into management of the prostate cancer is a process in evolution,” he says.